In typical heuchera culture, the Georgia Peach has a vibrant peach-colored foliage that is hard to ignore. This makes it a star plant for a variety of gardens. The foliage also features touches of silver and burgundy veins that deepen and intensify as they approach fall. This beautiful heuchera hybrid has the fashionable large, grape-like leaves that can grow up to 8 inches wide. The leaves fade to a pink hue tinged with orange in mid-spring, but they maintain their silvery sheen. In summer, dainty, snow-white blooms appear on 30-inch stems. The Georgia peach can grow up to 14 inches high with a 24-inch spread. This hardy cultivar grows vigorously adapting well to different garden conditions. It is preferred by many because it drought, heat, humidity and sun resistant. For optimal performance it is best planted in full sun with part shade.An excellent companion heuchera plant is the Obsidian Heuchera. It can also grow on a wide variety of soils, thriving even in the poorest soils. Plant it in dry or moist soils, the Georgia Peach will survive and remain vibrant. However, depending on the intensity of the sun, the leaves may diminish ever so slightly, springing back with full vigor in fall, displaying vibrant shades of burgundy, pink and scarlet. This heuchera’s ideal locations for are Northeast, Midwest, Pacific Northwest, West and Southeast. The best time to plant is in the fall, by placing the crown at level with the soils surface. Remember to water in before planting. This variety like most hybrids, is deer and rabbit resistant, but it attracts hummingbirds and butterflies. It is a great choice for small spaces and also a fantastic choice for mass plantings. It can be used as a cut flower plant, producing excellent flowers to brighten up any space. It is also excellent border and garden plants, providing fall and winter aesthetic interests. It makes an excellent companion plant to obsidian heuchera, bleeding heart, hosta and a variety of astilbe. 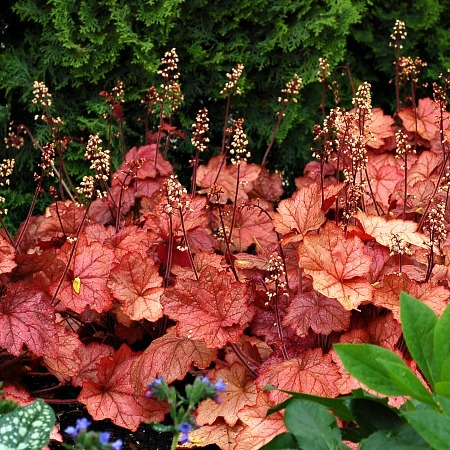 Like other heuchera varieties, you can buy these coral bells for sale here at our online store. Georgia Peach Heuchera is grown in a trade gallon container. Orders shipping to CA or AZ may be bare rooted before prepping to ship.